Agricultural waste is not only a sustainability problem related to food security but also an economic problem since it has a direct impact on the profitability of entire food supply chain. Sustainable management of agricultural waste is a systematic approach towards reducing waste and its allied impacts over the entire life cycle, starting with the use of natural resources, production, sales, and consumption, and ending either with final disposal or recovery. Management of agro-waste focuses on three main aspects (i.e., recycle, reuse, and reduce [R3]). Building on this familiar concept of “R3” will impact environmental protection and more fully recognize the impacts of the food and agriculture wasted. Thus, in the chapter, the authors highlight the sustainable utilization of waste generated from coffee and cocoa processing for the development of value-added products. Food and agriculture waste is getting a lot of consideration and has reached alarming levels. Yearly, approximately one-third of produced food for human consumption is getting lost or wasted. To overcome such a problem of food and agriculture waste, several by-products have been studied so as to weigh up their potential to reuse either totally or partially in the food industry or other. Coffee and cocoa industry is one of the classical models of generation of waste during the production process right from the field to the cup. The coffee and cocoa residue has been tried with different purposes to give a new life. Food and Agriculture waste not only imply a major negative issue in balancing food resources but also causes several socio-economical and environmental impacts too. The Public is more interested in increasing food and agricultural production to meet future food crisis, but providing inadequate attention to losses in the global food supply chain. Approximately one-third (1.3 billion tons/year) of food produced for human consumption is lost or wasted worldwide (FAO, 2011). According to Food and Agriculture Organization of the United Nations (FAO), “food loss” refers to a decrease in mass (dry matter) or nutritional value (quality) of food that was originally intended for human consumption. The term “food wastage” embraces both food loss and food waste (FAO, 2013). In general, food or agricultural loss is either lost or wasted right through their supply chain, from early production down to ultimate household consumption. Food Wastage Reduction: Beyond improving losses of crops on farms due to poor practices, doing more to better balance production with demand. Re-usage Within the Human Food Chain: Finding secondary markets or donating extra food to feed vulnerable members of society. If the food is not fit for human consumption, it should be diverted for livestock feed. Recycling and Recovery: Waste recycling, anaerobic digestion, composting, and incineration with energy recovery allow energy and nutrients to be recovered from food waste. The spent/residue is otherwise defined as by product that is generated during the production or manufacturing process that can be of value addition and not just waste. It can be further used directly other than normal industrial practice. However, it must fulfil all pertinent product, environmental and public health protection requirements for the specific use with no adverse environmental and/or human health impacts. According to the International Coffee Organization, around 84.3 million bags of Arabica and 59.1 million bags of Robusta coffee were produced worldwide. The highest per capita coffee consumption is owed by Europe among the world coffee segments. The EU consumes 2.5 million tons of coffee per year, which equates to 4 kilos of roasted coffee per EU inhabitant per year. As a result, large amounts of spent coffee grounds are generated (Ayala and Fernadez, 2017) Proper management of spent coffee grounds has become a challenging problem as the production of this waste residue has increased rapidly worldwide (Kim et al., 2017). Used coffee grounds are inexpensive and widely available materials that can be utilized to reduce the levels of nitrite, nitrate and ammonia in wastewater (Mariana et al., 2018). 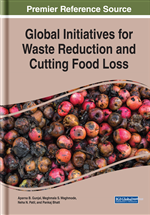 Hence, throughout in this chapter, more specific and current attempts to recuperate food wastes or even high value-added components derived from them are discussed with a special emphasis to the coffee industry.